Ubuko Mpotulo (10), from East London, was diagnosed with Meningococcal Septicaemia, at the age of 3 years old, Ubuko underwent a Bi-Lateral Amputation and finger amputation, when the lining of his blood vessels became damaged and obstructed his narrow arteries and eventually cut off his blood supply. Despite coming from a disadvantaged background, Ubuko has been awarded a Bursary to attend Selborne Primary, after the Educators and Governing body saw his resilience and perseverance shine through his Disability. Ubuko’s disposition has also captured the hearts of his medical team. 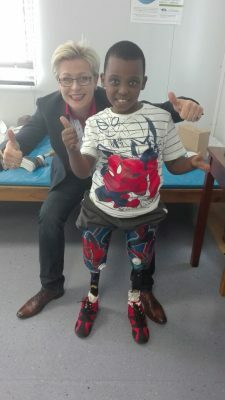 “I finally met Ubuko and those of you who have had the privilege to meet him will understand that he only has to look at you once and you are done, the mischievous smile and determination in his eyes caught my heartstrings.” – says prosthetics specialist, Marissa Nel, who has personally committed, jointly with Ossur, to cover Ubuko’s medical costs that are amount to about R148 000 a year. Until Ubuko turns 18, his prosthetic sockets will need to be refitted and changed at least 14 to 16 times until he stops growing. Unfortunately this will still be long-term struggle for him. According to Nel, because Ubuko is growing, his socket will likely need to be changed in the next 6 to 8 months, when he will require alignment adjustments, and replacement of some of his prosthetic parts. Ubuko has also inspired a group of 7 Round Tablers from East London, who have decided to take on the 70.3 Ironman challenge on the 27 January 2019 to contribute towards Ubuko’s ongoing medical costs, through a campaign launched on donations based crowdfunding platform, BackaBuddy. “Ubuko’s character and perseverance to improve himself are unmatched. He isn’t simply adapting to his prosthetics, he has relished the opportunity to seize his moment and make it count. Not only has he taken each step in his progress with enthusiasm, he has flourished.” Says Round Tabler, Ryan Baisley (37). For the past 6 months, the team met 3 to 4 times a week, starting at 4 am, to do triathlon specific training to prepare for the one of the toughest endurance events. The event, organized by the World Triathlon Corporation (WTC), consists of a 3.86 km swim, 180.25 km bicycle ride and 42.20 km marathon without breaks. “Out of the 7 athletes competing, 4 are novices to the Triathlon world and many of us started off as being really unfit. On the days when our legs were in pain from 60km cycle sessions into blistering hot headwind, we would remind ourselves how Ubuko feels everyday and the discomfort he has lived with his whole life.” – says Baisley. To wish the team luck, Ubuko will meet the whole team, many for the first time, at the Ironman Expo, where he will also have an opportunity to view the latest triathlon gear and equipment and experience the exhibition before the event takes place. The BackaBuddy campaign went live on the 15 of January 2019 and has thus far raised R 13 166.78 with contributions from 24 donors towards the fundraising target of R50 000.
https://www.backabuddy.co.za/steps4ubuko or on the www.backabuddy.co.za. Funds raised will be managed by Round Table and used for Ubuko’s ongoing medical procedures. – BackaBuddy is a proudly South African crowdfunding platform where individuals have the opportunity to raise funds for causes they feel passionate about. – BackaBuddy has raised over R90.4 million for various charities, individuals and causes across South Africa.